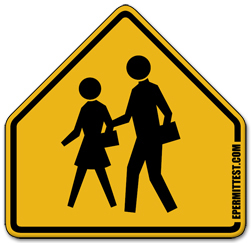 Five-sided sign back on yellow is used only to warn of schools and school crossings. Slow down – school zones have a speed limit you must observe. Watch out for children crossing the street or playing. Be ready to stop. Obey signals from any crossing guards. New fluorescent yellow-green signs may also be used.